is totally devoted to the Dolomiti of Fanes, with a hint to their legends. "Meridiani Montagne", for those who don't know it, is an Italian magazine whose monthly issues are devoted each to a single mountain, or a group of mountains, usually chosen within the crown of the Alps. 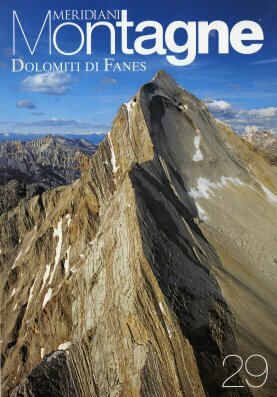 Our friend Norbert Spina alerted me that issue n.°29, Nov. 2007, deals with the Dolomites of Fanes. The lion's share is taken by itineraries: hiking, climbing, mountain biking etc., always very clearly described and documented. There are a lot of wonderful photos. But there are also articles devoted to every natural and cultural aspect related to the mountains, including local cuisine and, in our case, legends. The enclosed map, scaled 1:25,000, is somewhat simplified but, for this same reason, appears very clear and easy to read. Unfortunately, it doesn't stretch south enough to cover the Lagazuoi and even the peaks of Fanes and most of the Alpe di Fanes grande. Printing requirements, I guess, but the map's usefulness, at least for my own usage, gets significantly reduced. The section devoted to legends is entrusted to Marina Morpurgo, a clever journalist who is a fan of mountaineering, and in her spare time writes charming fables for children. Maybe because of this "specialization" of her, the writer deals with the Fanes' legend as if it were a fable, not realizing that the morphology of the tale is completely different (by the way, in the Ladinian tradition, real fables can be seldom found, and most of them are imported). She approaches the topic by confining the Fanes into an escapeless dreamworld and - in my honest opinion - doesn't even scratch the real core of the problem. I'm also quite puzzled at the statement that the character of the wildman, widely spread in the folklore of at least one half of Europe, be known as "... Salvanel in the Ladinian valleys and (not by chance) Fanes in the Badia valley." This way, the conspicuous structural differences among the quoted characters are completely overlooked, although the Salvan (this one being the true Ladinian equivalent of the wildman) is mentioned not only by Wolff, but also by Alton, De Rossi and others. In any case I truly appreciated that Marina Morpurgo quoted in her writing both this site - and I thank her for that - and that of Susy Rottonara's Associazione Culturale Fanes. Finally, we can find a hint to the "stone king's" head near the Falzarego pass, a third instance of which is proposed: I'm commenting on it in a few lines I added to the former news, where I pointed out having retrieved the second one. To summarize, I believe that this issue of Meridiani Montagne is anyway a must for everyone who is interested at the Fanes, or more generally loves their wonderful mountains.